Part Three of Match Play allows you to be the designer and choose a stitch pattern for Side Two. You may have noticed that I have not referred to the pieces as Front or Back, but as Side One and Two. The reason for this is that you will select which stitch pattern will grace the front of your poncho. If you had a grand time knitting Side One, and prefer a matching front and back, then this is the option for you. Simply repeat Side One exactly and you will have a completely reversible poncho. If you are ready for a rest from intricate diamonds and twists, this option covers Side Two in the Dot Pattern with no central motif. Side One’s Diamond Pattern will serve as the front and the simple dots of Side Two will serve as the back of the poncho. Did you adore the diamonds and are ready to ramp it up? This option places lace stitches inside of the diamonds for added beauty and a bit of a challenge. Side One’s Diamond pattern will serve as the back of the poncho and the lacy version will serve as the front. Let’s examine each option to help with your decision. Nothing new here to add. Work another Side One and you will have a matching front and back for a reversible poncho. 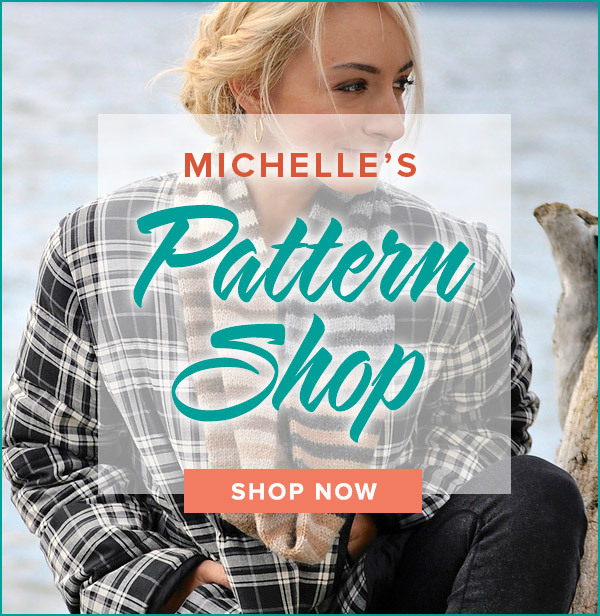 Scroll down to the first week’s Part One to download the pattern if you need a fresh copy. A little zen knitting is in store with this selection. The simple textured beauty will cover the entire side of this piece. The garter border is identical to Side One, but the Set Up increases the stitch count by one – 209 total stitches with the Dot Pattern worked over the 199 Body stitches. The edges remain in garter with a slipped stitch edge as on Side One. If six Diamond Pattern repeats were worked on Side One, you will end Side Two after working Row 8 of Dot Pattern or 21 repeats of the eight row Dot Pattern. The neck shaping for this side will be included in next week’s Part 4. Put your feet up and enjoy the relaxing knit! The central motif with this choice is worked in the same manner as Side One. The borders, set up, edge stitches and Dot Pattern are worked exactly as in Side One. The difference is that a lace motif is added to the inside of the diamonds. There are both written and charted instructions for this version. I once again color-coded the chart to help differentiate the twists and decreases to simplify working across the rows. Also, the chart used to track simultaneous diamond and dot row numbers will work for this section as well. You can print off a fresh copy of that cheat sheet here. The lace inserts are formed from yarn overs and carefully placed decreases. 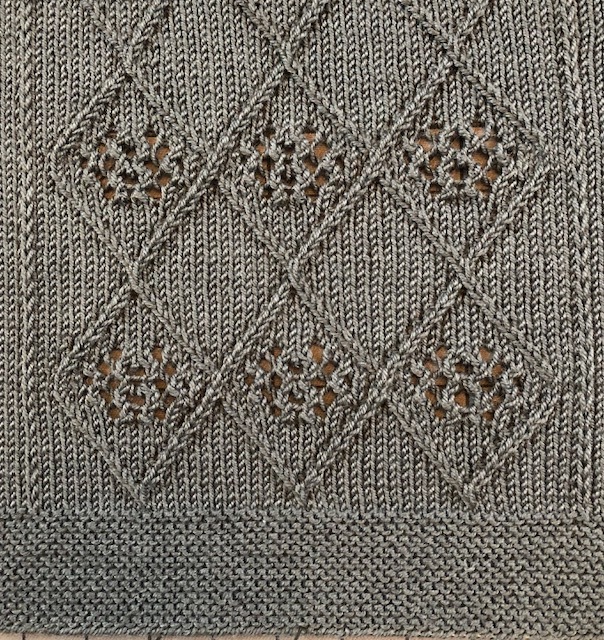 The lace includes double yarn overs in Rows 13 and 17. The Double Yarn Over, also know as yo twice, creates two extra strands on the needles. When these two strands are worked on the following row, a hole substantially larger than a single yarn over is formed. For Continental knitters, a double yarn over is made by simply scooping up the working yarn twice, placing two strands on the right hand needle, and then proceeding with the next stitch. 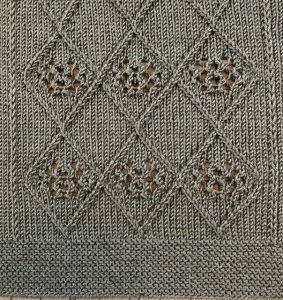 For Western-style knitters, a double yarn over’s execution is determined by the stitches surrounding it. When a double yarn over is between knit stitches, the working yarn is brought between the needles to the purl position, taken over the top of the right hand needle and then under the needle to the front returning the yarn to the purl position. One strand has been placed on the right hand needle. Keep the working yarn in front as the next stitch is knit to form the second strand in the double yarn over. A K2tog and SSK are considered to be knit stitches and are treated as such in the execution of a double yarn over. On the row following a double yarn over, the two new strands must each be worked in different stitches to preserve them. In Match Play, the first yarn over in the pair is purled and the second yarn over is worked as a knit stitch. 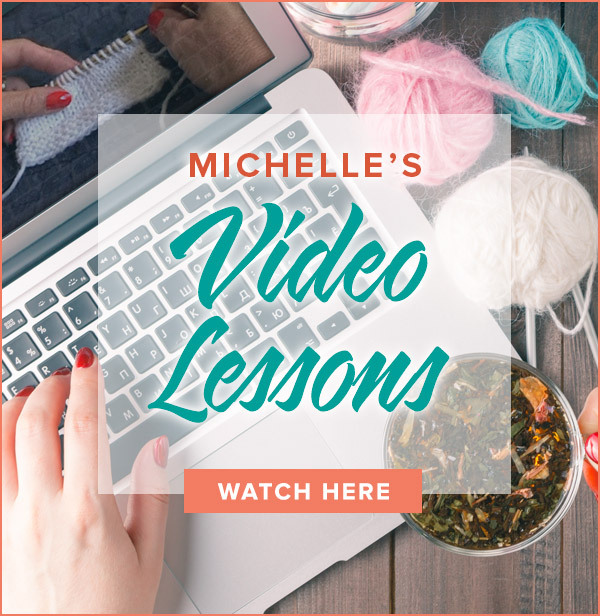 A complete lesson on double yarn overs for both styles of knitters is found in my Double Yarn Over (yo twice) video. Repeat the Lacy Diamond pattern six times or to the same length as Side One. The neck shaping will be included in next week’s Part 4. Speaking of Part 4, the KAL is wrapped up with the remaining neck shaping, shoulder seams and neck. Keep up the good work and you will be wearing your poncho soon! Refresh your browser and the instructions will be at the top of the page. Happy knitting! Where are the instructions for the neck? So sorry about the missing set up rows! Please let me know that the rest of the pattern is going smoothly for you! Hi, I sent a question about making up for my forgotten set-up rows, but have decided to unravel and start over the front, so please disregard. Thanks! The pattern has been tested and is correct. What part is giving you trouble? Yes there are set up rows. I inadvertently left them out. I corrected the mistake late day on Thursday. You can download the corrected version now. My apologies! Anybody having trouble with row 15 Option #3. I must be reading it wrong. Are you knitting from the inside or the outside of the skein? The yarn is wound tighter in the center so the outside strand tends to be more relaxed. Place the yarn a few feet away from you in a yarn bowl or project bag and try pulling from the outside. If it is still twirling, try rewinding the skein in a relaxed fashion. Yarn that is wound very quickly on a swift tends to have more torque and can contribute to the “worming” you are experiencing. ooooh….I’m super behind on this project but love how the design is unfolding!! !